Whether you're an amateur gardener, or a master gardener, you and your family can enjoy the benefits of gardening - gardening in the landscape around your home, fruit and vegetable gardening, or indoor miniature gardening. No matter what form of gardening is most appealing to you, be sure to invite the members of your family to join in with you, you never know, it might turn in to your family's new favorite hobby! And also, gardening is just plain fun! It brings the family together. It beautifies the environment around us. And sometimes it even produces tasty fruits and veggies for us to enjoy. I have so many memories as a child of being outdoors with my family. On the weekends we would go on hikes together in the Cuyahoga Valley National Park, we would play kickball with the other families in our neighborhood, and we would plant a large vegetable garden every summer. Planting that vegetable garden is the earliest memory I have of gardening. I so vividly remember starting the seeds with a seed-starter kit, watering them and watching them grow, transplanting them into the ground, and harvesting tomatoes, cucumbers, zucchini, lettuce, herbs and more! It was, and I still consider it to be, a very rewarding experience. If it wasn’t for my parents introducing me to gardening, I don’t know if I would be in the career that I am today. I am so thankful that they did. So take a second to consider if maybe there is a young person in your life that hasn’t had the opportunity to plant a garden – maybe you can be that person who inspires them to pursue a career in an environmental or horticultural related field. If you’re interested in starting to garden with the members of your family, first decide if you want to plant a garden with flowers and shrubs, or if you want to plant a garden with edible plants such as fruits, veggies or herbs. Or maybe it’s even a combination of the two. 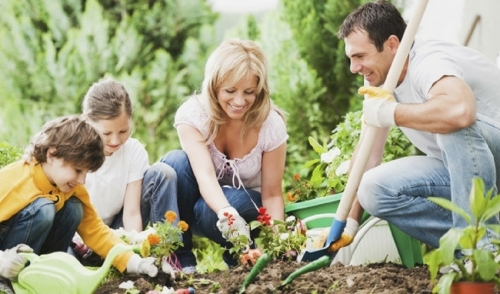 There is no right or wrong way to garden, especially when it turns into a family activity. Let all members of the family choose plants that they like or are attracted to, then they will be more inclined to take ownership of their plants. It can be a great activity for teaching lessons about responsibility. No two families are the exact same. And neither will two gardens ever be the exact same. So don’t hesitate to get started, and don’t be afraid to just try something new! Come on by the nursery this weekend to be inspired by all of the beautiful plants that are just waiting to be planted by you and your family!